Now you’ll investigate the converse of the conjecture you made in Question 1 of the last investigation. 1. What do you notice about the perpendicular bisector of a chord? Drag parts of your sketch to confirm that this is always true, then write a conjecture (Perpendicular Bisector of a Chord Conjecture). 2. Hide the center of your circle. Now perform a construction to locate the center. Explain how you did it. 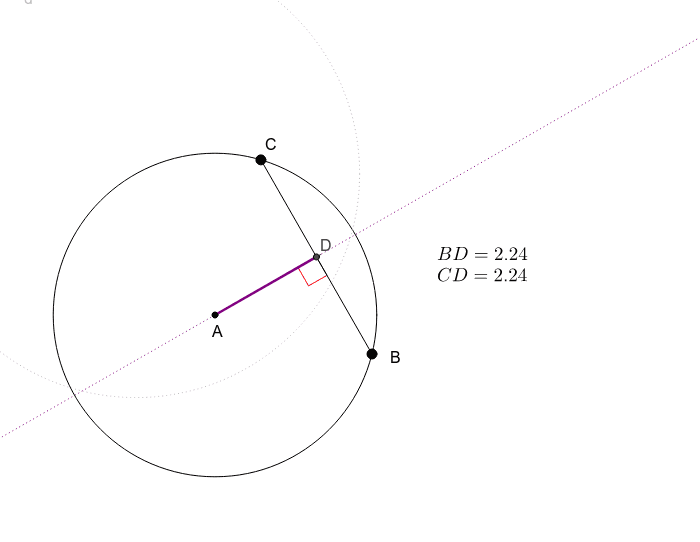 Perpendicular Bisector of a Chord Conjecture: The perpendicular bisector of a chord passes through the ____________________________________. The perpendicular bisector always passes through the center of the circle. Chords don't have perpendicular bisectors.